Article originally appeared in the Union Recorder by Billy Hobbs. MILLEDGEVILLE, Ga. — When Naomi Holsey-Hicks Hardy was a little girl she dreamed of someday becoming a schoolteacher and living to be at least 100. Both of those dreams have now been realized. For four decades, she was a classroom and substitute teacher in the Baldwin County School District. 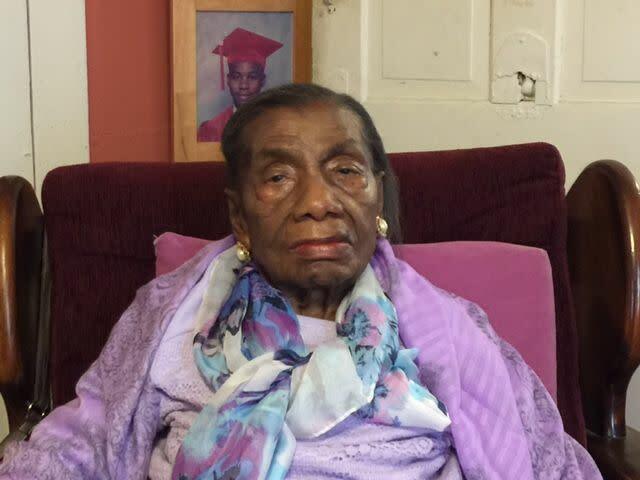 And just recently, the Milledgeville woman celebrated her 100th birthday on April 11 with three days of celebration. She attributes her long life and overall good health to having lived a Godly life, one in which she has tried to be obedient and serve the Lord. As a little girl growing up in neighboring Hancock County, Hardy worked in cotton fields with many of her siblings to help her parents earn a living. “It was real hard work,” recalled the soft-spoken Hardy. She remembers many things that happened to her in the past, and has even begun writing down many of those memories for her family. In a purple-colored composition notebook, Hardy writes about many of her fondest memories in life. She talked about her parents being Christians. By the time she started school at age 5, she already was smarter than most students her age. “I knew my ABCs and could count,” she said. She remembers her first two schoolteachers and where she went to school. The school wasn’t in a traditional school building, but instead inside Pearson Chapel A.M.E. Church. Her first two teachers helped inspire her to want to become a schoolteacher. Hardy still is recognized as the oldest member of the local Georgia chapter of retired educators. Her life has been wrapped around her strong faith and the teachings of God and helping others along the way. He, like many of her friends as well as family members, helped her celebrate her 100th birthday. Stone, and her two sisters, Nettie Knox, and Barbara Garnes, helped their mother celebrate her historical birthday, as did five of their aunts, all of them their mother’s sisters whose ages are 98, 93, 92, 87 and 84. Stone said when she and her other siblings were growing up their mother was outspoken. Stone said her mother, who taught math, reading and English when she was a schoolteacher, is in pretty good shapre with the exception of a stroke that she sustained back in February. “She’s doing pretty good, considering,” Stone said. Hardy had been able to get around with the use of a cane prior to the stroke, but now has to use a walker to get around in her home. She receives medical care every day from Janette Glenn, a CNA, who has become more like a member of her family. “Mrs. Naomi still reads from the Daily Word every day and prays everyday,” Glenn said.